Cochran Hall, built almost a century ago as a men’s dorm, dining hall, and YMCA, will enter its second hundred years as a new home for alumni. When the $6 million renovation and restoration are complete, Cochran will again feature many of the ornate details that greeted dignitaries at its dedication in 1908. But it will also be a thoroughly modern structure designed to help propel Allegheny forward in the twenty-first century. Because of its vintage, every living alumnus likely has some recollection of the building. Over the years, the grand brick and terra-cotta structure at the center of the campus has housed more than a dozen functions, including a bowling alley, the post office, the College radio station, the English department, and a fondly remembered student hangout called the Grill. When construction crews pack up next year, the renewed Cochran Hall will host a restored grand dining room, a library, a gathering space for alumni functions, a gallery, and new homes for the alumni affairs and development offices. The work was made possible by two major gifts. Patricia Bush Tippie ’56 and her husband, Henry B. Tippie, a Texas businessman, donated $5 million for the overall restoration of the building. 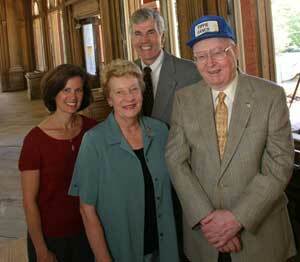 Bill and Carol Tillotson, classes of ’52 and ’54, respectively, gave $1 million to restore the oak-paneled dining room. In recognition of their generosity, the alumni center will be called the Patricia Bush Tippie Alumni Center and the dining room will be named for the Tillotsons. The building itself will retain its original name, Cochran Hall, after Sarah B. Cochran, a generous benefactor to the College who also served as the first woman on Allegheny’s board of trustees. Their gifts help maintain the momentum of the physical transformation of the College, following the Campus Center renovation. Two other major projects are planned: the new Vukovich Theatre and Communication Arts Center and apartment-style residence halls for a project called “the North Quad.” The gifts also help maintain the momentum of the College’s $105 million fund-raising campaign, Tradition & Transformation, which so far has raised $90 million, most of it from alumni. The Patricia Bush Tippie Alumni Center will solve a problem found at Allegheny and most other colleges—the lack of an appropriate place to greet returning alumni, some of whom have been away for decades. In the past, alumni have often said they wished there was a central place on campus where they could go for assistance or to relax and gather with friends. Some had even sent pictures of alumni houses at other institutions, with the hope that Allegheny might someday have one, too, says Director of Alumni Affairs Phil Foxman ’90. The Tippie Center meets that need. “This will be a welcoming place where somebody will help you,” Foxman says. “You’ll get a hello right away and a cup of coffee if you want it.” The building will also give Allegheny a restored showpiece at the center of campus, where both alumni and prospective students and their parents will see it. In its original incarnation, Cochran was one of the grand American college buildings of its era, featuring massive oak beams and exterior light fixtures cast in Florence, Italy. Cochran also offered a skillful mix of architectural styles: Roman-style arched windows, a great English-style entry hall, and a dining room done in Italian villa style. Persian rugs adorned the first floor—and will again, thanks to the generosity of Albert Moomjy, whose late wife, Alice Condayan Moomjy, was a 1952 graduate of the College and whose son Robert is a 1985 grad. To restore the building’s luster required the help of modern-day artisans. For instance, the fluted oak columns in the great lobby had fallen into disrepair. Buettell turned to Larry Palmiero, a Meadville woodworker who is steaming the old columns apart and replacing damaged pieces with bits of 100-year-old oak from his own stock. This will allow the new pieces to match the old when they are reassembled in the lobby. The contractors are also using some high-tech restoration methods in the main dining room where the oak paneling had at some point been painted white. To remove the paint, the contractors spray on an environmentally friendly paint remover, which is covered with a special paper. When the paper is removed, the paint simply peels away with it. The ornate chandeliers that lit the room in 1908 have unfortunately been lost. But the College is acquiring new ones made in the style of the originals. And in front, where four of the stately terra-cotta columns have been damaged by the freeze-thaw cycle of Pennsylvania winters, molds made from the good pieces will be used to cast new terra cotta to replace the damaged parts. The end result of these efforts will be a restored masterpiece from the turn of the twentieth century. “You will feel like you’re walking into a 1908 building,” Buettell says. The new alumni center represents the most extensive renovation and restoration of a historic structure on the Allegheny campus. And it sits at the center of campus, near its venerable neighbors, Bentley, Reis, and Montgomery. “It was essential to retain this building in order to retain the historic fabric of the campus,” says project architect Bill Brennan, of the Pittsburgh firm of Celli-Flynn Brennan Turkall. Brennan says that similar projects are being undertaken throughout America’s older small colleges, which have come to realize the value of retaining historic, ornate structures that are often remembered with affection by alumni. In Pennsylvania, for example, similar efforts are under way at Westminster, Grove City, and Washington & Jefferson. “These older buildings are absolutely an asset in drawing students and faculty to these institutions,” Brennan says. But the practical result will be a building geared to the needs of the twenty-first century, a building that will help Allegheny connect to its thousands of alumni, who have as vital a role to play in the College’s future as they have had in its past. This article was featured in the Winter 2004 issue of Allegheny Magazine.